36 D I V E R S I T Y W O M A N W i n t e r 2 0 1 8 d i v e r s i t y w o m a n . c o m foods, she'll start the day with a sensible breakfast and have a light lunch so that "it's not a total loss of a day." 2. Pack a yoga mat or gym shoes. When leaving home, Khadijah Salaam always brings her yoga mat and running shoes. Salaam, a Denver-based full-time veterinarian who also teaches and takes belly-dancing classes, often goes on busi- ness trips for work or personal reasons. "I bring my mat so I can do seven-minute workouts. I have an app for that. 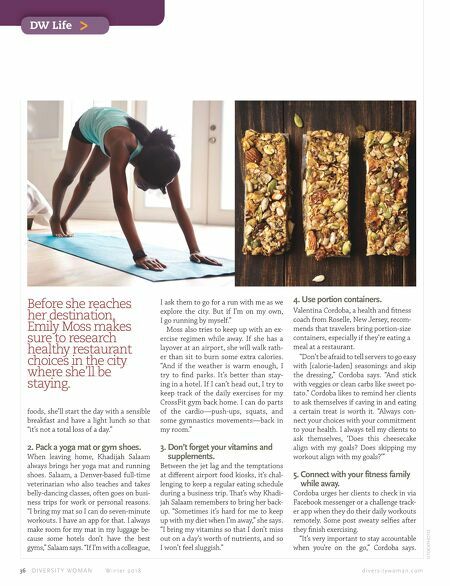 I always make room for my mat in my luggage be- cause some hotels don't have the best gyms," Salaam says. "If I'm with a colleague, ISTOCKPHOTO DW Life > I ask them to go for a run with me as we explore the city. But if I'm on my own, I go running by myself." Moss also tries to keep up with an ex- ercise regimen while away. If she has a layover at an airport, she will walk rath- er than sit to burn some extra calories. "And if the weather is warm enough, I try to find parks. It's better than stay- ing in a hotel. If I can't head out, I try to keep track of the daily exercises for my CrossFit gym back home. I can do parts of the cardio—push-ups, squats, and some gymnastics movements—back in my room." 3. Don't forget your vitamins and supplements. Between the jet lag and the temptations at different airport food kiosks, it's chal- lenging to keep a regular eating schedule during a business trip. at's why Khadi- jah Salaam remembers to bring her back- up. "Sometimes it's hard for me to keep up with my diet when I'm away," she says. "I bring my vitamins so that I don't miss out on a day's worth of nutrients, and so I won't feel sluggish." 4. Use portion containers. 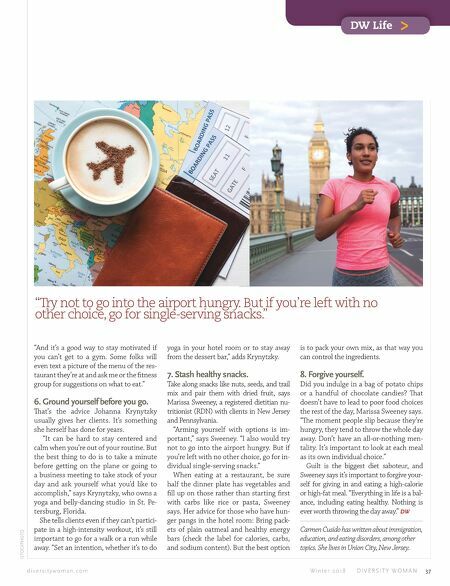 Valentina Cordoba, a health and fitness coach from Roselle, New Jersey, recom- mends that travelers bring portion-size containers, especially if they're eating a meal at a restaurant. "Don't be afraid to tell servers to go easy with [calorie-laden] seasonings and skip the dressing," Cordoba says. "And stick with veggies or clean carbs like sweet po- tato." Cordoba likes to remind her clients to ask themselves if caving in and eating a certain treat is worth it. "Always con- nect your choices with your commitment to your health. I always tell my clients to ask themselves, 'Does this cheesecake align with my goals? Does skipping my workout align with my goals?'" 5. Connect with your fitness family while away. Cordoba urges her clients to check in via Facebook messenger or a challenge track- er app when they do their daily workouts remotely. Some post sweaty selfies after they finish exercising. "It's very important to stay accountable when you're on the go," Cordoba says. Before she reaches her destination, Emily Moss makes sure to research healthy restaurant choices in the city where she'll be staying.